Thanks to NASA’s and ESA’s copyright policies, we are able to share with you in our headers a selection of images from the Hubble Space Telescope. Our header images are cropped, resized and in some cases rotated from the originals below. 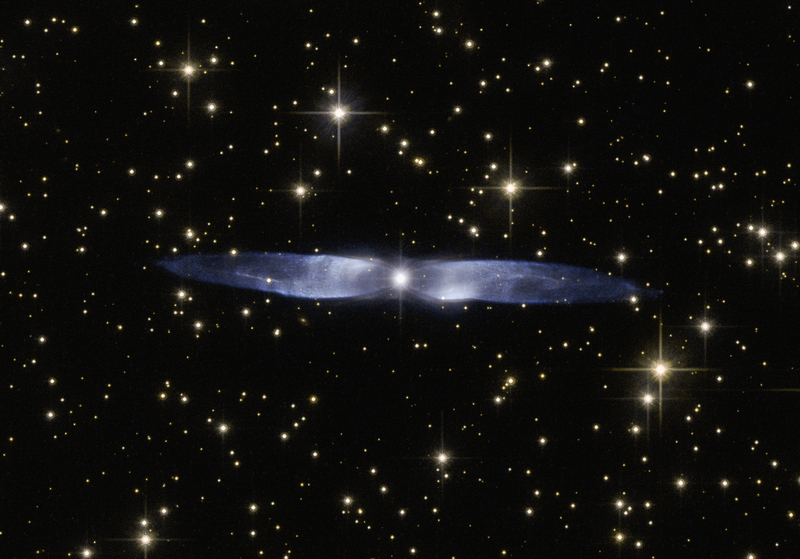 In this cosmic snapshot, the spectacularly symmetrical wings of Hen 2-437 show up in a magnificent icy blue hue. Hen 2-437 is a planetary nebula, one of around 3000 such objects known to reside within the Milky Way. 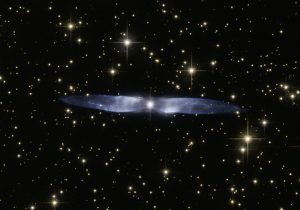 Located within the faint northern constellation of Vulpecula (The Fox), Hen 2-437 was first identified in 1946 by Rudolph Minkowski, who later also discovered the famous and equally beautiful M2-9 (otherwise known as the Twin Jet Nebula). Hen 2-437 was added to a catalogue of planetary nebula over two decades later by astronomer and NASA astronaut Karl Gordon Henize. Planetary nebulae such as Hen 2-437 form when an aging low-mass star — such as the Sun — reaches the final stages of life. 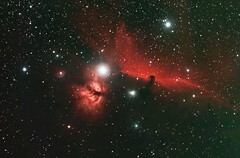 The star swells to become a red giant, before casting off its gaseous outer layers into space. The star itself then slowly shrinks to form a white dwarf, while the expelled gas is slowly compressed and pushed outwards by stellar winds. As shown by its remarkably beautiful appearance, Hen 2-437 is a bipolar nebula — the material ejected by the dying star has streamed out into space to create the two icy blue lobes pictured here. 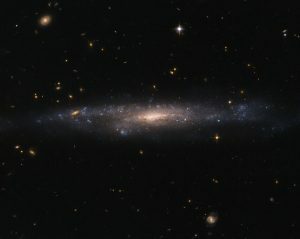 Despite its unassuming appearance, the edge-on spiral galaxy captured in the left half of this NASA/ESA Hubble Space Telescope image is actually quite remarkable. Located about one billion light-years away in the constellation of Eridanus, this striking galaxy — known as LO95 0313-192 — has a spiral shape similar to that of the Milky Way. 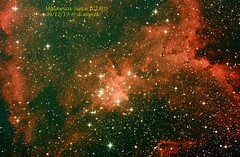 It has a large central bulge, and arms speckled with brightly glowing gas mottled by thick lanes of dark dust. 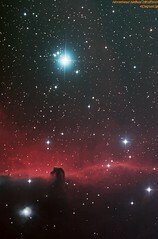 Its companion, sitting pretty in the right of the frame, is known rather unpoetically as [LOY2001] J031549.8-190623. Jets, outbursts of superheated gas moving at close to the speed of light, have long been associated with the cores of giant elliptical galaxies, and galaxies in the process of merging. However, in an unexpected discovery, astronomers found LO95 0313-192 to have intense radio jets spewing out from its centre! The galaxy appears to have two more regions that are also strongly emitting in the radio part of the spectrum, making it even rarer still. The discovery of these giant jets in 2003 — not visible in this image, but indicated in this earlier Hubble composite — has been followed by the unearthing of a further three spiral galaxies containing radio-emitting jets in recent years. This growing class of unusual spirals continues to raise significant questions about how jets are produced within galaxies, and how they are thrown out into the cosmos. 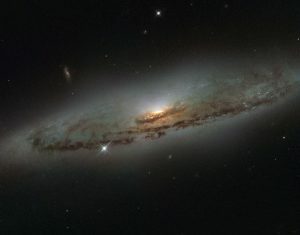 This striking NASA/ESA Hubble Space Telescope image captures the galaxy UGC 477, located just over 110 million light-years away in the constellation of Pisces (The Fish). UGC 477 is a low surface brightness (LSB) galaxy. 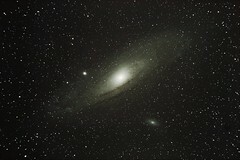 First proposed in 1976 by Mike Disney, the existence of LSB galaxies was confirmed only in 1986 with the discovery of Malin 1. LSB galaxies like UGC 477 are more diffusely distributed than galaxies such as Andromeda and the Milky Way. With surface brightnesses up to 250 times fainter than the night sky, these galaxies can be incredibly difficult to detect. 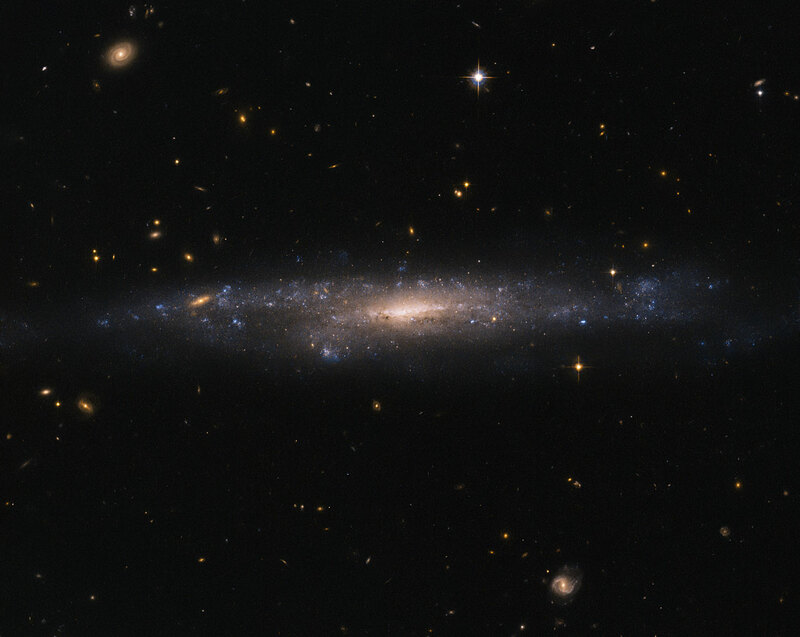 Most of the matter present in LSB galaxies is in the form of hydrogen gas, rather than stars. 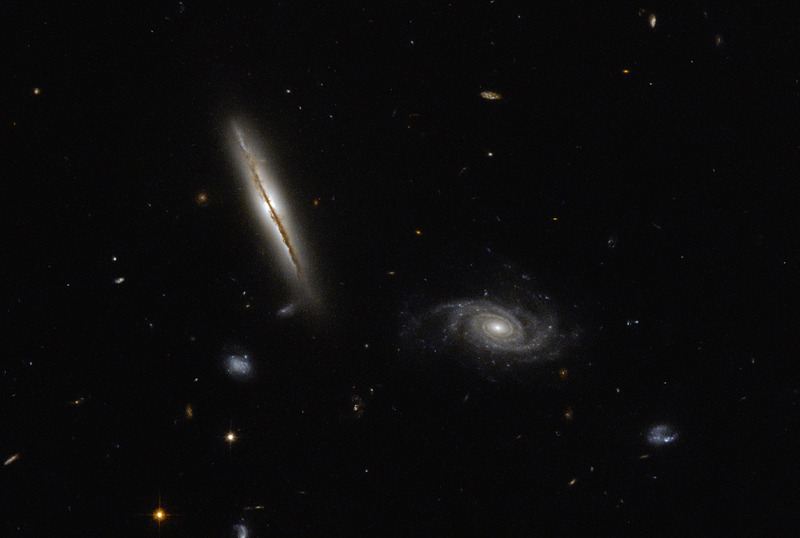 Unlike the bulges of normal spiral galaxies, the centres of LSB galaxies do not contain large numbers of stars. Astronomers suspect that this is because LSB galaxies are mainly found in regions devoid of other galaxies, and have therefore experienced fewer galactic interactions and mergers capable of triggering high rates of star formation. LSB galaxies such as UGC 477 instead appear to be dominated by dark matter, making them excellent objects to study to further our understanding of this elusive substance. 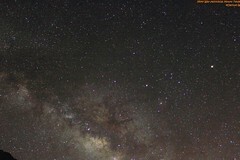 However, due to an underrepresentation in galactic surveys — caused by their characteristic low brightness — their importance has only been realised relatively recently.